- Continuity None Christmas Special 2010 - Getting Hit in the Nuts is Always Funny! - Is There ANYTHING You Do That's Not Bumping Into Things? - Taking Another Break! - Captain Obvious? I don't know anyone by that name! - Daleks Have No Concept of the Fourth Wall - In His Defense, The Next Monster of the Day Could Be an Egg-Creature - CATASTROPHIC ERROR - Mr. Gorbachev, Tear Down the Fourth Wall! - Ooh, Fancy New Camera Angles! - When All Else Fails, Choose The Comedy Option! - MARVIN IS AMUSED AT YOUR SILLY, TIME LORD QUESTIONS - Marvin Hasn't Given His Half-Breed Son "The Talk" Yet, Because He Hasn't Been Given It Himself - Angrish - Dalek, You ARE the Father! 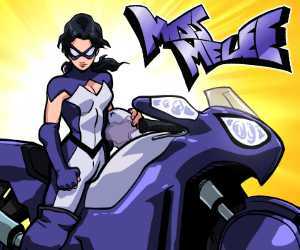 - It's a Role-Reversal, or Something! - The Joke is That the Dalek's Name is Marvin - Ignorance is Bliss Only for the Ignorant - Just a Generic "Dumb Green-Haired" Joke - WHAT A TWEEST! - Finnish Intermission - The Doctor's Back Shows Its Sadistic Side - Extra Comic: Production Interruption - Hooray for Racism! - The TARDIS Doors Become Possessed by The Ghost of Don Martin and Performs Some Very Unconvincing Slapstick - The Doctor's Knees Reveal Their Ignorance Whilst Romana Sees Things She Can't Unsee - The Fourth Doctor's Talking Crotch Has No Time For K9 - SeÃ±or Wences Is Spinning In His Grave - That's The Same Joke They Used In The Last Comic! - What Do You Mean, It's Not A Common Oversight? - Oh dear, he's landed on the /b/ Planet... - If You Say "Care for a Jelly Baby?" One More Time, I'm Gonna Pop You. - HaHA! RECURSIVE Entendre! - A Tiny Freak of Nature Attempts to Eat A Time Lord and his Talking Clothes - The Effects of LSD on a Beatle - Jaro Diabeetus - Robots Have No Sense of Irony, Nor Can They Cause Sound Effects - Starscream Defies Simple Logic Whilst Cyclonus' Chest Voices Unfitting Double Entendres - A Bush Disappears at Dusk - A CHALLENGER APPROACHES - Robots Can Be Amputees, Too! - Unlucky Garfield - Who Dropped This Title On My Head? Hah, I made this on March 26 of this year, honestly. I've got absolutely no idea what will happen before this, or if I will introduce this relationship in the comic before this comic appears. For all I know, I may quit the comic before Christmas! That's a Mutant Reveal Dalek and a Figma Tsuruya-san. God, that pose looks unnatural, doesn't it? I was trying to get her to be closer to the Dalek, but she kept falling over. Yes, I know that's a terrible fireplace. 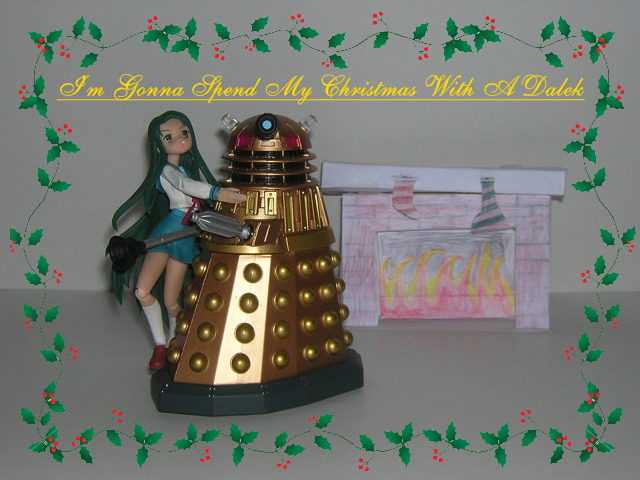 “I'm Gonna Spend My Christmas With A Dalek” is a novelty Doctor Who song by The Go-Go's.